The C110 is designed using the new reissued SSI2144 IC. It is an updated version of the original SSM2044 with lower noise, better control feedthrough but preserving all the sonic characteristics of the original design. Like many filters the SSM2044 suffer from gain loss when the resonance is increased , the C110 includes an especially designed circuit co correct that. This circuit can be activated or deactivated on the front panel allowing the user to select between the traditional response and the gain compensated response. 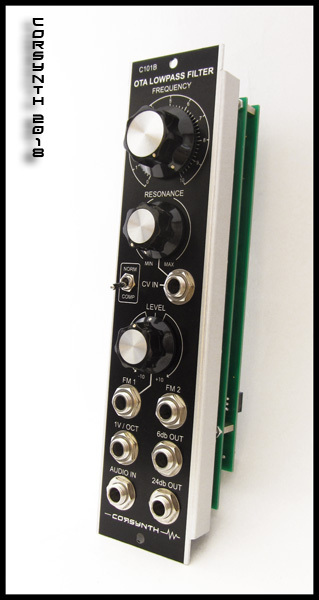 The FM2 input has a 0,66 V/Octave response expanding the modulation range to 7,5 octaves using the typical 5V envelope. These demos have been created using two C104 VCOs, a C105 VC Noise and a C110 VCF Filter. The rests of the modules used are LFOs, envelopes and VCAs. All sounds heard in these demos have ben filtered using the C110 2044 VCF.Only delay / echo has been added as FX..